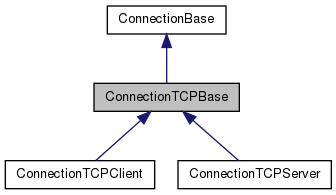 This is a base class for a simple TCP connection. Definition at line 37 of file connectiontcpbase.h. 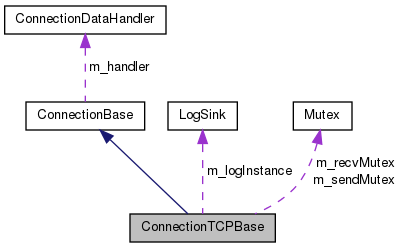 Constructs a new ConnectionTCPBase object. server A server to connect to. port The port to connect to. The default of -1 means that XMPP SRV records will be used to find out about the actual host:port. Definition at line 48 of file connectiontcpbase.cpp. cdh An ConnectionDataHandler-derived object that will handle incoming data. port The port to connect to. The default of -1 means that SRV records will be used to find out about the actual host:port. Definition at line 57 of file connectiontcpbase.cpp. Definition at line 73 of file connectiontcpbase.cpp. Definition at line 151 of file connectiontcpbase.cpp. Definition at line 80 of file connectiontcpbase.cpp. Definition at line 145 of file connectiontcpbase.cpp. Definition at line 104 of file connectiontcpbase.cpp. Definition at line 115 of file connectiontcpbase.cpp. This function allows to set an existing socket with an established connection to use in this connection. You will still need to call connect() in order to negotiate the XMPP stream. You should not set a new socket after having called connect(). Definition at line 96 of file connectiontcpbase.h. Gives access to the raw socket of this connection. Use it wisely. You can select()/poll() it and use ConnectionTCPBase::recv( -1 ) to fetch the data. The socket of the active connection, or -1 if no connection is established. Definition at line 88 of file connectiontcpbase.h.